ESRI and its Licensors, All Rights Reserved. Arizona has more than 30 state parks where people can camp, go boating, go fishing, visit museums, see natural wonders, hike, picnic and, in general, enjoy the beauty of Arizona. These parks are managed by the State of Arizona, and are different than the national parks managed by the National Park Service. On the map above you'll find the locations of all the Arizona state parks. You'll notice that there are no state parks in Maricopa County, where the metro Phoenix area is and where most of us in Arizona live. There are several, however, within a couple of hours from most Greater Phoenix locations, close enough for a day trip if that's all the time you have. 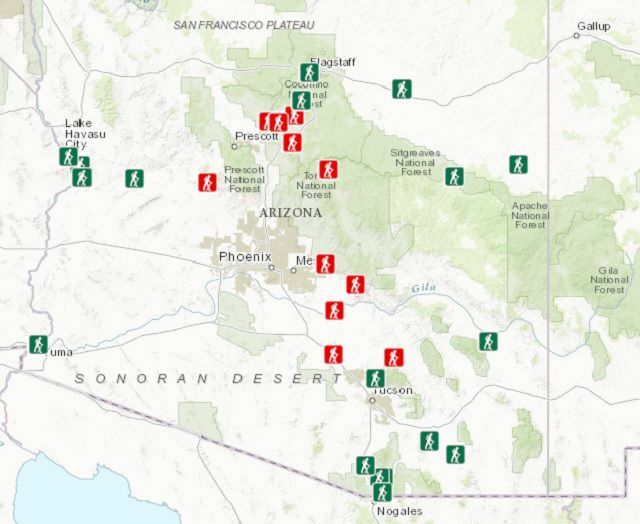 The Arizona state parks on the map with red markers are within 120 miles of Phoenix. As you plan to visit the various Arizona state parks, be aware that the weather is very different in different parts of the state, as are elevations of the parks. Dress accordingly, and be prepared for inclement weather in Northern Arizona during the winter. See a larger, interactive version of the Arizona State Parks map here. If you visit Arizona State Parks a few times per year, you can purchase an Annual Pass for day use (not camping), good for the pass owner and up to three additional adults in the same vehicle. The annual fee is $75 (plus service charge). The pass is not valid at Lake Havasu, Cattail Cove, Buckskin Mountain, and River Island on weekends (Friday-Sunday) and state holidays from April 1 through October 31. Othe restrictions may apply. A Premium Pass is also offered. Active duty military and retired veterans who reside in Arizona are eligible to receive a discount card, and 100% disabled veterans who reside in Arizona may receive a free day-use pass. These day-use passes are good for one year. Other park fees or program fees are not included, nor are use of camping facilities. Pass holders are not guaranteed admission to any park that is closed for any reason. Annual passes for day-use fees at Arizona State Parks may be purchased online. You can also purchase one by phone, mail, or fax. Credit cards are accepted. For questions about annual passes you can call 602-542-4410 Monday through Friday between 10 a.m. and 4 p.m. Arizona time. 1. There are fees to enter the parks, and the fees vary, up to $30. 2. At the parks that permit camping fees start at about $15 per night and may go as high as $50 per night. They allow a maximum of six adults and no more than 12 total people per campsite. 3. Some parks have cabins that can be rented. 4. Many of the parks now allow you to make reservations up to 365 days in advance. There is an additional non-refundable fee for that. Here are the policies and restrictions about reservations at ArizonaState Parks as well as for the Kartchner Cavern Tours. 5. Leashed pets are allowed at Arizona State Parks, but not in the buildings or museums. Exceptions: pets are not allowed at Red Rock State Park or on the trails at Tonto Natural Bridge State Park. 6. There are no senior discounts, and the passes for National Parks like the Grand Canyon are not accepted at Arizona State Parks. 7. Many parks have special events and activities during the year. Check the calendar. You'll find historical enactments, star parties, archaeology programs, bird walks, guided tours and more. 8. If you want to take your off-road vehicle to an Arizona State Park, you can find out where you can ride here. 9. You can find a link to each Arizona State Park, and the phone number for more information, by clicking on the markers on the map here. 10. For more information, visit Arizona State Parks online. You can see all the Arizona State Parks locations marked on an ESRI map. From there you can zoom in and out, etc.